What makes your heart sing, your skin tingle and your mind burst with creative imagination? Is it a poem, a photograph, a piece of art, a piece of music, a sunset, or maybe a person? It’s exciting to be sparked by external inspirations. I want to draw your attention however, to the possibility of finding inspiration deep inside yourself. I have noticed in my 30 years of counseling that most people are conditioned to look outside themselves for inspiration. We often talk about being inspired BY others or BY a song or piece of art. What most people don’t realize is that they can inspire themselves. The ancient Celtic bards knew this truth intimately. 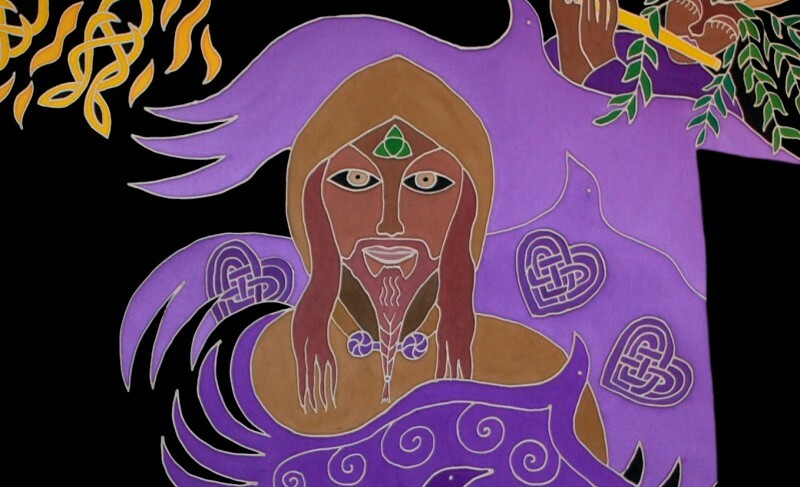 The Celtic bard pictured above is the main figure on Megan’s 18th sacred robe for Inspiration. This bard can teach you to find deep and unshakable inspiration from deep within yourself. As part of their rigorous training, the Celtic bards would retreat into the forest for days, weeks, months, even years at a time to find the muse within that was the source of their own inspiration. They had to be alone with themselves so they could learn to deeply listen to their own sounds, their own deep voices and their own inner stirrings. They also learned how to BREATHE. After all, inspirare means to breath in, to inhale. As you learn to learn to breathe deeply into your spirit, you can connect with your inner muse. Your muse may be verbal and so your inspiration is triggered by poetry or beautiful verse. Your inner muse may be musical and so your inspiration is triggered by sound and music. Your muse may be visual so your inspiration is triggered by sunsets or interesting city landscapes.